NASA's Latest Poster Featuring Future ISS Crew Is Strong With The Force. 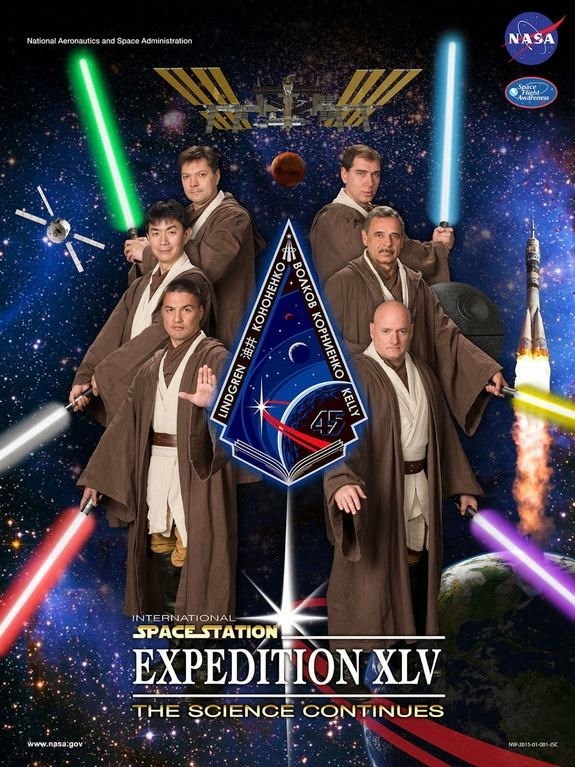 NASA on Thursday (Feb 12th) revealed the official poster for the International Space Station expedition 45 crew and it has a Star Wars theme as the crew are all dressed as Jedis and sporting Lightsabers. It's just not fair. The crew have one of the greatest jobs in the world and they get to dress up in Star Wars gear too. The expedition kicks off in September. The official poster is entitled: "International Space Station Expedition XLV: The Science Continues." The crew consists of Scott Kelly and Mikhail Kornienko (right, bottom and middle), together with NASA astronaut Kjell Lindgren (left, bottom), Russian cosmonauts Sergei Volkov and Oleg Kononenko (right, top and left, top) and Kimiya Yui with the Japan Aerospace Exploration Agency.